Iomega's new StorCenter PX Series provides a great combination of affordability, features and performance. This review will focus on the px4-300d. Iomega Corp.'s (an EMC company) new StorCenter PX Series, which is aimed at smaller businesses, provides a great combination of affordability, features and performance. These models have similar feature sets and specifications, with the differences being the number of drives and the form factor. The px4-300d is a desktop unit that supports up to four drives, while the px6-300d is another desktop unit that supports up to six drives. The px4-300r is a rack unit that supports up to four drives. This review will focus on the px4-300d, which is the smallest device. A big change in the StorCenter PX series as compared to the StorCenter ix-Series is that you can now purchase your own drives and don't have to use the drives provided by Iomega. The px4-300d can be purchased without hard disks and supports both SATA and solid-state disk (SSD) drives. The px4-300d has drive carriers that can support both 2.5-inch and 3.5-inch hard disks. Another nice feature with the px4-300d is the drives are easily accessible with a front door that swings open to reveal easily removable driver carriers. The px4-300d is a solidly built unit and is fairly quiet to operate, with a maximum noise level of 30dBA. It is also power efficient, with a maximum power consumption of 45 watts. You can also set the drives to power down after a period of time to further reduce energy consumption. The front panel LCD screen provides handy information on the status of the unit such as error messages, IP address and free/used disk space. The unit comes with 2 Gb network connections that can be bonded together in one of three modes: Failover, adaptive load balancing, and link aggregation (802.3ad) to maximize performance and availability. Iomega totally revamped its Storage Manager software for the PX Series and includes a desktop application to help you discover Iomega devices and a Web interface to manage them (see Figure 1 below). 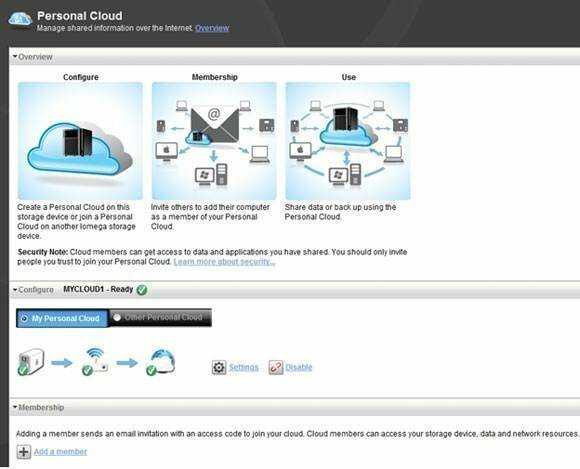 One new feature is called Personal Cloud (see Figure 2 below), which allows you to share backup data to other computers over the Internet for free. When you configure a personal cloud, your px4-300d is registered with Iomega, which serves as the central coordinator for other computers to connect to your storage device. The setup is pretty quick, and the only settings that can be changed are the port number that is used and the security level for data encryption. Once it is configured, you can then invite members to join your personal cloud so they can access data, perform backup jobs, stream media and more. Another nice feature of the px4-300d is its integration with online backup services, which allows a smaller business to back up their critical data easily. Both Amazon S3 and Mozy (recently acquired by VMware) are supported to automatically back up files, but the Mozy integration is better than the Amazon S3 integration. One limitation with Amazon S3 is that file uploads are limited to only 5 GB in size. With Mozy, you can specify automatic backup schedules and limit the backup speeds during certain time periods. You can also view the backup status and logs as well as restore files directly from the px4-300d interface. You can also schedule local backup jobs and copy data to or from any other NAS device, Windows share or any storage that is connected to the px4-300d via its USB ports. The px4-300d can act as both an NFS server and as an iSCSI target which makes it usable as shared storage for servers and virtualization. The px4-300d is listed on VMware’s hardware compatibility guide, so it is an officially supported device. It’s also certified to use with Microsoft Cluster Server and Hyper-V, and supports the Live Migration feature as well. Setting up NFS is fairly simple, you go to the "Protocols" screen where you can see all the various protocols that the px4-300d supports and turn NFS support on. Once NFS is enabled, you can choose how users on client computers are mapped to the px4-300d. You can also add rules to specify the hosts that are allowed to access shares using NFS. To set up iSCSI, simply click on the iSCSI link from the menu and enable it. Once enabled, you can configure it to use a local or external iSNS server and also configure two-way CHAP for security. iSCSI volumes are handled a bit differently from NFS shares. With NFS, when you create a share no space is allocated to that share so it works like thin provisioning where space is allocated as data is written to it. With iSCSI, you define the size of the iSCSI volume and all that space is allocated as soon as you create the share even though no data has been written to it yet. Another difference between the two is that NFS shares simply use the existing multipurpose shares that you create when you configure the px4-300d—iSCSI drives can only be created from space that is not allocated to shares. So if you create one big share using all available drive space when you configure the px4-300d you will have no room to create iSCSI shares. The Iomega PX Series competes with similar devices such from Drobo Inc., NetGear, QNAP Systems Inc. and Synology Inc. From a feature perspective, it is right on par or better than the competition because the px4-300d supports almost every protocol and device available.. However, it lacks depth in a lot of its features such as iSCSI and NFS, and there are not many configuration options for each. This could be viewed as good to those looking for simplicity, but advanced users who like customization might be turned off by this. Overall the px4-300d nicely fills the gap in Iomega’s product line for SMBs that are looking for an affordable storage device. The ability to choose your own drive types and sizes, as well as use SSD drives, is probably the biggest improvement over the ix4-200d. In addition, the PX Series has enough enterprise-like features such as Active Directory, SNMP and cloud integration that allow it to be used in a variety of environments. About this author: Eric Siebert is an IT industry veteran with more than 25 years of experience covering many different areas but focusing on server administration and virtualization.